Cristiano Ronaldo, Lionel Messi and Manuel Neuer have been named on a three-man shortlist for this year's Ballon d'Or prize, Fifa has announced. The three were chosen from an initial 23-man list, which included Gareth Bale, and the world player of the year award will be announced on 12 January. Nadine Kessler (Germany), Marta (Brazil) and Abby Wambach (USA) were shortlisted for the women's award. 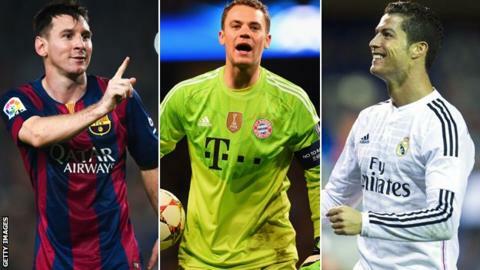 Focus Forum: Messi, Ronaldo or Neuer for the Ballon d'Or? Real Madrid forward Ronaldo won the Ballon d'Or in 2013. Meanwhile, Real Madrid coach Carlo Ancelotti, Germany's World Cup winning boss Joachim Low and Atletico Madrid coach Diego Simeone are on the shortlist for the Fifa coach of the year. Portugal international Ronaldo 29, scored 51 goals in the 2013-14 season while helping Real Madrid win the Champions League. He beat Bayern Munich's Franck Ribery and Barcelona's Messi to the 2013 award. Four-time winner Messi, 27, won the honour in 2009, 2010, 2011 and 2012. The Argentina forward broke the La Liga goalscoring record last month and also holds the Champions League goalscoring record. Meanwhile, Bayern Munich's Neuer, 28, is the first goalkeeper to make the final three since compatriot Oliver Kahn made the shortlist in 2002. Neuer helped Germany win the 2014 World Cup in Brazil, which came after helping Bayern to the 2013-14 Bundesliga title. The Ballon d'Or - formerly the Fifa World Player of the Year award - has featured Messi in either first or second place in each of the last seven years. Wolfsburg boss Ralf Kellermann, Germany under-19 and under-20 coach Maren Meinert and Japan coach Norio Sasaki were shortlisted for the Fifa world coach of the year for women's football award. Who voted for whom at the Ballon d'Or? Read more on Ballon d'Or 2013: Voting breakdown, who voted for whom?